Recently my 2-year mobile phone service contract with Verizon ran out. About three months before that day, Verizon called me and said that they wanted to give me a paltry (my description, not theirs) discount on a new phone. They have a "new every 2" plan which provides this discount. I told them I would think about it. But what I was really thinking was that they have me over a barrel while I'm still under contract. Mobile communications companies will penalize you for cancelling service with them before your contract term is over. I think it's $175. To evaluate whether a deal is good or not, you need to be able to compare it to competing equivalent services. When switching service includes a $175 penalty, that's a pretty good incentive for staying with your current provider. That's the purpose of the penalty. And they'll charge you that fee right up to the day before your contract is up. When I got the call from Verizon, I knew they were only motivated to dangle a mediocre deal in front of my face, because I was still stuck with them and, predictably, they were only going to offer me the minimum to get me to stay. On the other hand a different company will offer you a better deal to switch. Ryan found a deal through iTalk.com for free phones, and a rebate on top of the phone, if you signed with Sprint. I could have called up Verizon and asked them for a better offer, but how do you ask your cellular company for a free phone and for them to send you extra money on top of that? So I waited for my contract to expire, and then ported my number to a new account with Sprint. Verizon called to find out why we switched. Maggie took the phone call. I think she told them that we switched because their offer was lousy. Even answering their question is doing them more of a favor than they would do for you (giving them information they want after you've already terminated the business relationship). Try accessing your Verizon account to pay your bill online, see your phone usage or check what you owe Verizon two seconds after you've ported your number. You can't; they completely lock you out as soon as you port your number. You don't have an account anymore, and that's business. So, perhaps Maggie should have answered "that's none of your business." But she's a person, not a corporation. Sprint is probably no better. But they offered me a deal. I will say this about Sprint -- I have been very happy with the customer service. I had weird a problem with my new phone (which has a strange two-sided design that makes it impossible to remove the battery) and a tech at Sprint spent a good amount of time with me on the phone trying to fix the problem, and then just said "give me your number, I'll call you back when I've solved the problem." I didn't have to wait on the phone and he called me back 15 minutes later after doing something on his end that fixed what was wrong. Moral of these stories? I dunno. Always shop around when your contract is up, I guess. I thought there were service providers who would buy out the rest of your time with a competitor in order to get you to switch, if your contract was almost up, but maybe I'm thinking of something else. With Cingular (now AT&T) I can get a new phone free every year, but to do that I have to sign a two-year contract. I've had my phone for about a year and it's not very good, but I'm going to hold out so I can switch (or at least have the option to switch) next year. a) I bought an unlocked phone online that was compatible with the SIM cards of several providers (TMobile/Cingular/AT&T/Verizon) for $50 - its an LG F9200. 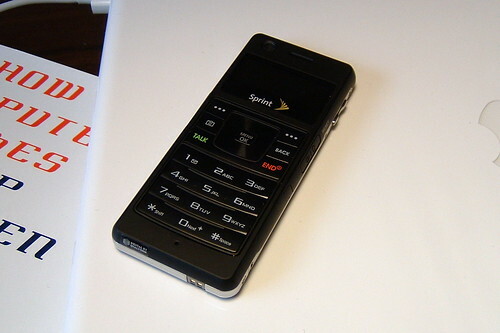 I stuck my SIM card in it from my old Cingular Motorla ROKR that had died. It worked immediately and all of my numbers came over. Unlocked phones on eBay - awesome. b) I truly hope you have better luck with Sprint than I did. I've had varying levels of acceptable service with every carrier except Sprint/Nextel - they were... um. let's just say not good and leave it at that.